Sinclair Radionics - an inside view. Part 2. On January 31st, 1966, I travelled up to Cambridge, in advance of the official move. The date is burnt into my memory for I was caught speeding in Trumpington, just south of the city! I was to help Nigel Kember organise the move of the Comberton department which had seriously outgrown the village hall, and was moving into 22 Newmarket Road before the London end closed down. Once again I was commuting fairly often to Thetford, to get the new Stereo 25 and PZ3 into production at Harvey Hall Electronics Ltd. in Thetford. The rest of the time I was helping the Comberton branch move to the new premises. Or doing a few repairs. The official move was in April. I was at 22 Newmarket Road waiting for Jim Westwood an Martin Wilcox when two new people turned up: Lindsey Lloyd and his follower - a rather nervous Christopher Curry! And then there were five! We were in two rooms on the top (second) floor of the house. In those days (most of 1967) Chris Curry and I had a flat in 24 Green Street, in the centre of Cambridge, on the first floor above what is now Bangkok City restaurant and which was then a cafe. Oposite was a pub - the Turk's Head, with an entrance to its Cellar Bar just opposite. Chris Curry, Lindsay Lloyd and Martin Wilcox would not infrequently visit the Turk's Head, and often an impromptu party would occur in our flat after closing time. I had a Leak Stereo 30 amplifier driving a pair of large bass-reflex loudspeakers which were high up near the ceiling. I was into classical music and these parties always did well on music such as Offenbach's can-can, Rossini's William Tell overture, Radetzky March and similar popular clasics. Chris Curry has thanked me for the training I gave him into classical music! Chris says "Berlioz' March Hongroise (from The Damnation of Faust) was what compelled Jon Harris to have you (and me) turfed out of that wonderfully convenient flat opposite the Turk's Head in Green St - incidentally Jon Harris lives there to this day!" It was during this period that Jim Westwood got disillusioned with Clive Sinclair and left Sinclair Radionics. He got a job as a gas-fitter, doing natural gas conversions for Gascol. But it took less than a year for him to get disillusioned with his disillusionment and return once more to Sinclair Radionics, where he stayed close to Clive Sinclair for the rest of his working life. Martin was an extremely clever engineer, and we had great respect for his abilities. But we used to tease him! It must have been sometime in 1967. Sinclair's laboratory space consisted of the top floor of two rooms at his offices at 22 Newmarket Road. In one room I shared with our chief engineer, Martin Wilcox, and Chris Curry. In the other room were Jim Westwood and Lindsey LLoyd. Martin had just bought a new wrist-watch. He was inordinately proud of it and kept checking the time against the mains driven wall clock. To the extent that Chris and I got fed up with it! In those days such a clock would keep time by using the 50Hz mains frequency. So, when Martin went out of the room, I got out a signal generator, connected it to an amplifier and power supply and used it do drive a mains transformer in reverse so we could feed the clock with the high voltage from the transformer. While I was doing that, Chris told the folks in the next door lab what was going on. Then Martin returned, we increased the signal generator's frequency so the clock started to run fast. Martin got worried and asked us the time - but Chris and I gad been advancing our wrist-watches to agree with the speeded up wall clock. So Martin got up and went next door. But we had used the intercom to tell them the time, so their time agreed with our wall clock. Chris Curry recalls the incident: "you had rigged the wall clock to a signal genny and we all watched while an hour passed in about eight minutes. Martin characteristically failed to see the reality and after getting more and more irritated about his new watch stomped off home muttering only to bump into Clive on the stairs - such was Martin's mood that he ignored Clive's curiosity and left anyway and we all had to keep quiet about the trick!" Then there was the time that Martin took up betting: he had this system where you start with a (very) small bet. If you win, you pocket the winnings and start again. If you loose, you increase the next bet so that, should you win, the winnings will cover all your losses to date. When you do eventually win, you start again with the small bet. Martin came in one day very pleased with himself, he had won! I forget the exact amount, maybe 5 shillings! 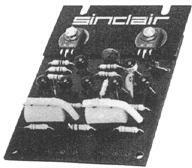 During 1965, Nigel Kember had found a small firm in Cambridge to repair Micro-6 and other Sinclair products. This was effectively two hard working Pakistanis - Massoud and Ali who traded under the name Malico. They had a workshop above a sweet shop in Carlyle Road, off Chesterton Road in Cambridge. A third person joined them later - Mo(hammed) Iqbal, who later founded Monitor Audio. But with the move to Newmarket Road, I was now handling all after sales contacts with customers, so was in-charge of servicing. I started quality sampling some of Malico's repairs: they were often not up to standard! Because of the source of the transistors, sometimes thee needed to be changed to get full performance. One of Clive Sinclair's dreams had been to sell a miniature television - the Microvision. Jim Westwood had been working almost exclusively on this since I had joined Sinclair Radionics in late 1964. In August 1966, Jim actually had a working model ready for the Radio and Television Show at Earls Court. I drove Jim down from London to Earls Court. Jim was holding the Micro-vision carefully as it was a very early prototype so very much of a bread-board, even it a sub-miniature one! His was naturally interested in how the TV coped with the varying signals between Cambridge and London, so he had the set switched on. It worked fine - even it re-tuning it was very fiddly. Signal strength is London was very variable at ground level and it would often fade out when shadowed by a large building. But I can say that we had the world's very first in-car television! Naturally the Micro-vision was something of a show-stopper. But the prototype really was not suitable for production and a saleable model was still many years away. The Microvision did not become a product until 11 years later. in 1977! By 1967 the germanium Micro-alloy transistors that Sinclair had used in the early Micro-6 were becoming obsolete, so Clive Sinclair set an engineer (I believe it was Jim Westwood) to work to design a new radio of the same size using silicon transistors. These of course were higher gain than the MATs used in the Micro-6 so the circuit could use fewer. 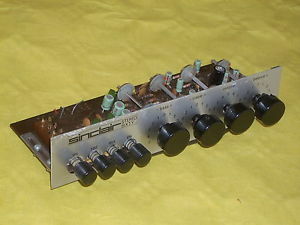 The Micromatic used two transistors instead of he Micro-6's three. Both circuits were reflexed (where the transistors are used twice, once at radio frequency and a second time at audio). The Micromatic was a cosmetic improvement on the Micro-6. The earlier Micro-6 had an adhesive gold label on its front. The Micromatic upgraded this to an adhesive-backed brushed aluminium decal. To avoid the plate damping the ferrite aerial excessively the lower half was pierced with decorative holes. The adverts for the Micromatic were phrased in Sinclair's usual enthusiastic manner, with such phrases as "Plays anywhere", "Amazing performance", "Bandspread at high frequencies"
So one customer returned his Micromatic with a comment "If this is amazing performance, then truly, I am amazed!." The Micromatic was a very successful product! It started life in early 1967, and was sold until the middle of 1971. There are various pictures of it in the images directory. Sinclair Radionics first hi-fi system, the Stereo 25 with the Z12 amplifiers was proving a good seller. Sales were increasing daily. So Clive Sinclair had decided we needed a loudspeaker. He had employed Wesley Ruggles Jr (son of the film director) to design this. Wes had an office/workshop on the ground floor of no. 22 where he sat for hours every day listening to different loudspeakers in different housings. The idea was to find a commercially available cheap housing, to keep bespoke woodwork to an absolute minimum. Eventually he came up with ta design that used an elliptical loudspeaker mounted on a particle board front backed by a fibre box which was a fan housing off, if I remember right, a Rolls-Royce. For its size and price it sounded very respectable. Wes had not gone for a bright or crisp or any similar sound used to sell loudspeakers, but had chosen the combination which he found easiest to live with long-term. Many of the other commercial offerings he had tried may have sounded initially impressive, but he did not find them easy to live with, unlike the Q14. The Q14 was released in the autumn of 1967. In 1968 it, with other hi-fi products caused much excitement at the London Audio Fair at Russell Hotel, but that's another story for later. There is a review of the Q14 in Tape-Recorder magazine, June 1968. Denys Killick said "The sceptics will have already raised their eyebrows. They will be thinking - as I did - that all this sounds much too good to be true. I will excuse anyone who glances at the price, shrugs his shoulders and dismisses the Q-14 as being unworthy of serious consideration. But this would be a most serious error of judgment. After a great deal of listening I have formed the positive and unshakable opinion that in the Q-14 we have the very finest value for money that it is possible for anyone to buy today." There was one problem with the Q14: the magnet that was in the drive unit was bonded in place with a glue which, frankly, was inadequate. If the speaker (or the parcel containing it) was dropped in the wrong way the magnet would slip and the whole speaker was useless. Of course Sinclair, true to their advertised conditions, replaced these without quibble. Martin Wilcox had been brought in because of his knowledge of amplifiers, to fulfil the contract for the Z-120. Having done that Clive set him loose designing a really good high fidelity amplifier. Clive had worked out the rough volume needed for such an amplifier and had conferred with his brother Ian, who was an industrial designer. Together they has come up with a mechanical design which Martin had to work to. The Neoteric saw the light of day early in 1968 just two years after we had moved to Newmarket Road. The Neoteric was first demonstrated at the 1968 London Audio Fair at Russell Hotel. Unfortunately the original design was something of a disaster! Martin had decided that ho would make the inside modular, so there were two power modules and a preamp. But the mechanics of this resulted in various metal sub-chassis and the whole thing was difficult to build and near impossible to re-work - in those days all such things were hand-assembled so production errors were not uncommon and faults had to be re-worked due to "finger thouble" as Harvey Hall (who was building them) called such mistakes. As a result very few of the early units were made and a new engineer, by name of Keith Pauley, was put to the task of re-laying the circuit to make it producible. Keith did a very good job and the Neoteric Mark 2 was a firm success: today, nearly 50 years later it is a sought-after unit. I have one myself! There are probably no Mark 1 Neoterics around today - if you know different, please contact me! However there are a number of adverse criticisms of the Neoteric on the www. These all appear to refer to the early version. The Mark 2 seems to have cured all. The Z12 and Stereo 25 with the Q14 had proven that there was a large market at the economy end of the hi-fi market. It had also boosted Sinclair's coffers so he was now confident that the expense of a bespoke case would be justified. So Clive decided to invest in a bespoke aluminium extrusion that would be cut to length and have end-plates fitted to make an attractive looking amplifier. I was given a circuit to implement. I have circuit and board information on the System 2000 which was not dissimilar to that used for the Sinclair Z12 and Stereo 25, with a few improvements. The System 2000 amplifier and speakers were first demonstrated alongside the Neoteric at the 1968 London Audio Fair at Hotel Russell, April 14th to 17th. At that time in Newmarket Road, Sinclair Radionics was growing fast. And the returns were also growing fast. I had been handing most of he repairs, staying behind after hours to do them, Wes Ruggles was absent - I recall he had gone to America for an unspecified time (he was never to return) and as unpacking returns was becoming too much for the general office, a young lady was employed to unpack returned parcels, using Wes Ruggles old office on the ground floor. The Service Department had been formed and I was the Service Manager. As I recall, that period did not last long. We started looking for new premises for the service department. Then AIM - a spin off from Cambridge Consultants Ltd. vacated their premises at 71-73 Fitzroy Street, moving to Enderby's Mill in St Ives. Clive Sinclair had always been close to Cambridge Consultants, so the service department moved to AIM's old premises. Aim left Fitzroy Street at the end of 1968 so the move must have been early 1969. I then had room to start employing staff: mostly female who I trained up to service the various items. Mostly returns were for similar reasons, and once the reason had been identified, it did not need trained staff to repair. Sales were increasing so fast that even when a manufacturing fault had been located and fed back to production, there were hundreds - even thousands - of items which might have the same problem. The Z12 and System 2000 were going strong. Both used germanium power transistors. Clive had negotiated with a new supplier to buy all their surplus stock. He had given them an absolute minimum test specification; something to the effect that, with 100mA base current, the collector current should be not less than 1 amp. That test specification did not reject very leaky transistors with an even lower gain. Suddenly we were inundated with problems. I located the cause of these and built a transistor tested which would pulse the transistor with a ramped up base current. The voltage cacheing that was uses as the X=axis of an oscilloscope while the collector voltage was used as the Y-axis. Thus a graph could be draws on the 'scope which would show voltage breakdown, leakage and gain. Once this test was implemented and tested transistors used for production, problems ceased. The tester was based on the improved emitter-coupled multivibrator which I later published on www.4qdtec.com. The test was therefore quite simple. Because the high current was pulsed, the transistor being tested did not heat appreciably so could be handled easily. Sometimes a transistor would indeed start to heat quickly: a dud! Testing was done by the daughter of one of the women doing repairs, who came in after school. But we were rejecting huge quantities of transistors. Yield was at one time very low - so the specified test was altered. But Germanium power transistors were going out of fashion. Silicon had started to come in. Fitzroy Street did not last long at all: the service department outgrew it within two years. AIM had moved to Enderby's Mill, but the premises were huge. The whole of Sinclair Radionics moved to Enderby's Mill in April 1971. But I moved the service department to the mill 6 months earlier: in October 1970. But I get ahead of the products! By 1968 the supply of Associated Transistors devices was running low, and germanium transistors were becoming a thing of the past. Silicon was the way forward. 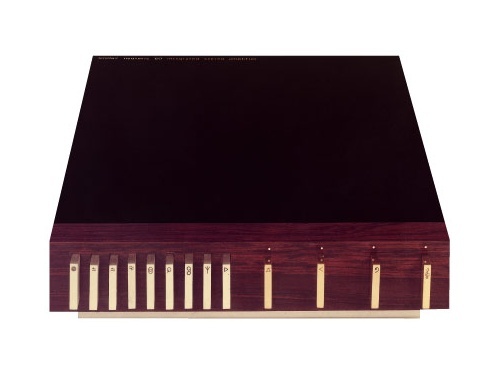 The Neoteric 60 was up-market and although an excellent amplifier, it was not for a market where Sinclair Radionics could flourish. So the old designs using germanium had to go. In November 1969 the new Z-30 was released with a new preamplifier, the Stereo-60, and a choice of two new power supplies: PZ4 (unstabilised) and PZ5 - a higher power stabilised power supply. To-date, I had written instructions for all the hi-fi range (with the exception of the Neoteric). I also wrote the Project 60 instructions, with drawings done by an excellent free-lance technical illustrator by name of Stan North. The manual is extremely comprehensive! Being the person who had answered all technical enquiries and done servicing on the Z12, I knew what people had tried to use them for and covered it all in the Project 60 Instruction manual. The whole 17 page A4 size manual for the Project 60 is available, with other technical information which is slowly being added. The manual includes circuit diagrams and component layouts for the Stereo 60, Z30, PZ5 and PZ6, with many application notes. The Project 60 was aimed at the economy end of the hi-fi market so there were of course compromises. 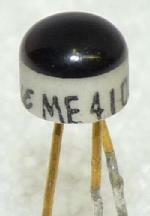 Germanium transistors were obsolete. Silicon was cheaper, more reliable, more predictable and more readily available. So it used silicon. The Project 60 started off using transistors made by Micro Electronics of Hong Kong (link is to their www site). Unfortunately their transistors had severe problems. The small signal ones were ceramic TO18 transistors. The chip was on a ceramic base through which the lead wires fed loosely. An epoxy was then put over the whole, holding the leads firm and the whole together. At least, that was the theory. In practise the leads were not always properly held in the ceramic and the act of spreading them to fit the board would sometimes break them loose. And a slight sideways pressure on a transistor would sometimes be enough to break the ceramic-epoxy bond: a lead would then push upwards and the top of the transistor would pop off. This of course caused problems in production and breakages in transit, and in the customer's hands! The other problem was with the power transistors. The chip would get hot and the silicon, lead wires, ceramic and epoxy would all expand slightly. The very slight different thermal expansions would cause failure of the bonding to the chip. These problems caused Sinclair to stop using these transistors which meant a re-design of the Z30. 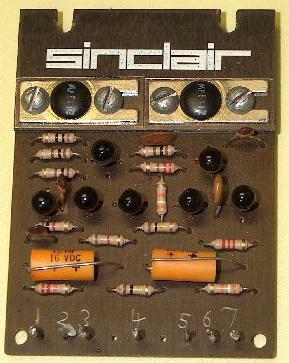 In place of the ME transistors Sinclair made a contract with Texas Instruments to have newly fabricated transistors tested to Sinclair's own specification. I still have these specification sheets and may publish them - so please ask. These are not reject transistors - they would pass as normal branded transistors - but the selections are such that they would work properly in the circuits as designed. 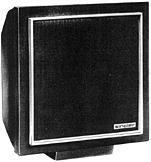 The redesigned amplifier was released in 1970 but the redesign allowed two versions: the Z-30 and the Z-50. There were no real problems with the Stereo 60 - but there were of course compromises in its design. The main compromise was in the use of skeleton pots. Two such were mounted on the board with an aluminium bar through the adjusting slots. This bar had a moulded-on plastic end onto which clipped the knobs. Initial experiments had been with an all-plastic item, which had far too much twist. The pots were linear, so volume matching was sometimes not good at the bottom end. And the aluminium could twist slightly so balance was not always perfect. But considering that the Project 60 enabled a user to afford a hi-fi system for a fraction of the price of other systems, these were good compromises. The circuit of the PZ4 is on page 17 of the instruction manual. It is stabilized, but has no over-current protection. Any electronics to which the customer has access is subject to stray contact problems - shorts, foreign objects etc. These can cause transient over-currents which will blow the power supply. Similarly a power transistor blowing will probably blow the power supply. But to current limit the power supply adds only a little more complication - but a current-limit alone will cause overheating and failure under fault conditions so is no use. So a trip must be used - and this is complicated, for the trip must operate under fault conditions but must still allow for the switch-on power surges. So we had to simply accept such failures as did occur. But, where repairs were not covered under guarantee, there was a low price fixed charge for service. A kit project such as this was aimed at a dangerous market and high returns were always likely: the adverts did say anyone could do it. Many of out customers were not "anyone"! In electronics (and most other fields! ), there have been many idiot-proof designs which have not been customer-proof! The Project 60 continued to be a good seller and further units and upgraded designs were released for it until it was superseded, after 4 years, by the Project 80 in late 1973, But more about all that in the next part. Just as the Z12 was obsolete because of the germanium transistors used, so also was the System 2000 amplifier. So it was redesigned in two versions. The System 2000 had a simple unstabilised power supply. The System 3000 was more up-market and had a stabilised, higher power supply. Technical information on both 2000 and 3000 amplifiers is available. One problem emerged - in the vicinity of a radio transmitter, the amplifier could become a radio receivers and the local radio station would be heard weakly in the background. Production was modified by fitting two extra capacitors and if any customer complained of this problem we would send them two capacitors with a technical information sheet showing where the capacitors should be fitted - and a letter saying that if they preferred to return the amplifier to the factory we would of course fit the capacitors at no charge. Last modified: March 18 2019 10:53:56. Written by Richard Torrens with contributions by Chris Curry.